On Sunday, August 24, Steven Pettee had to be rushed to the hospital from Special Gathering. Before the ambulance and his mother arrived, the teachers and elders gathered around him. Sitting on the floor in front of the elevator, we prayed that God would help him and bless him. We prayed for God to heal him. On Thursday, God totally healed Steven and took him home to live in heaven with him. Steve was a collector. He loved sea shells, CD’s, magazines, paper, puzzles. He collected pamphlets and had a grand selection of things he called “his stuff.” Like most gatherers, Steve wanted to be sure that his stuff came at a reasonable price. The family friend, Susie, shares Steven’s passion for gathering and they would go together to the thrift stores and yard sales. Steven relished the ability to get “his stuff” at a bargain price. Of course, like most truly gifted collectors, Steve knew that it wasn’t important for his compilation of things to be useful. While he always wanted CD’s, he never played them. His passion for books, magazines and paper was insatiable. He would spend hours pouring over his important papers, though he was never able to decipher the meaning of the neatly arranged letters that graced the pages. He would walk the beach to get his shells. Nevertheless, he really liked to pick them up from his sister Irma’s yard after she had collected them from the ocean front. She would scold him, “Get your own shells.” Of course, she’d usually give him the shells he wanted. Steven had a jovial, teasing sense of humor. He attached nicknames to people that he wanted to tantalize. His sister Donna become Donna the Doughnut. Jan never liked the name Janice–so that was what he insisted on calling her. They would tease and fret until he finally gave in and called her Jan. His niece, Lisa, became Lisa Pizza. Steve played and enjoyed sports. I’m guessing that the big attraction was to collect the trophies and ribbons. However, he was a champion swimmer and that was he life-long passion. He enjoyed golf, taking weekly lessons for a time. He bowled several times a week. Special Olympics was a part of his life from the time he was seven years old. The South Brevard Rec Department Friday night dances were an important to him for years. He and his girl friend, Patty Davis, would sway rhythmically to every melody, giggling and smiling at each other. However, more than “his stuff” or his activities and sports trophies, Steve was a collector of people. 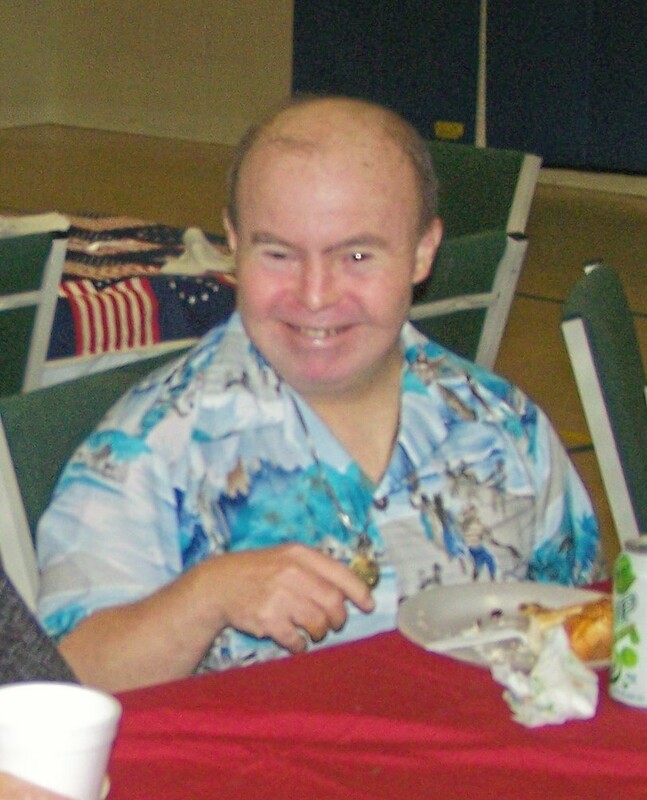 Everyone who spoke of Steven said, “He let me know that he loved me.” Most of his friends from Easter Seals, his day program, said that he had been their friend for 20 to 30 years. After work, Steve would come in and sit in the big, comfortable chair next to his mother. He’d rehearse with her the events of the day. He always wanted to be the one to check the mail and walk his dog. But then he would return to sit again letting his mother and dad know that being with his parents was the most important part of his day. Steven had a quiet simple way of letting everyone understand that they were important to him. After each worship service of Special Gathering which is a ministry within the mentally challenged community, Steven would amble up, smiling and waiting to give me a hug and tell me that he loved me. But he didn’t stop there, he made the rounds to everyone working to get ready for the next group to come and use the room. “Can I help?” He would inquire each of us. Often we would give him an errand, then explain that he had to go to the fellowship hall to eat his cookies so he wouldn’t keep anyone waiting. Satisfied that he was playing his part, Steve would leave the room heading to get his refreshments. Perhaps that is what made him an important asset to Pizza Hut. One of the happiest days of his life was when he got a job in the community. He started his career by making and stacking the carry-out pizza boxes. But soon his had won the confidence of his bosses and fellow employees. They gave him bigger tasks. He was able to fill in wherever he was needed. He was a dishwasher. He cleaned tables and on occasion he was even the pizza maker. Many Sundays these past years, Steve would come up to me after I had given the devotions and say, “I miss my dad.” His sister Donna told me that after her husband’s funeral in April, Steve went to every person and introduced himself to them. Then he hugged them and thanked them for coming to the service. I believe that out of his own longing for his beloved dad, he was giving comfort to those who needed it. Like he gathered his magazines and papers, clutching them close to his heart, Steve, the collector, was gathering the grieving family and friends to his heart and holding them close to himself and the Lord. It is vital to remember that The Collector is not dead but more alive than he has ever been. In heaven, Steve’s disability is gone and I think he has put aside many of his collections. The books and magazines and shells may be there but has grasped that only his collection of people has an eternal value. Going into his room, you’ll find his collections. The jigsaw puzzles, trophies and shells are neatly arranged. The papers and magazine are stacked. But be assured they are not Steven Ronald Pettee. They can serve as tools to prick our memories. Some days handling and sorting his collections will bring pain. At other times, they will be a sweet, satisfying memory of a man who pierced our hearts with love. But they are not Steve–or the essence of who he was and is. His relationship and friendship with his Lord is the lasting legacy that Steve leaves for us.